Working from home is a great way to cut back on energy use from driving your vehicle and running the AC, computer, lights, and other devices in your office. However, some of that unused energy can get reallocated to your home by keeping your AC on and using your home electronics. Investing in energy efficient Energy Star rated equipment can reduce your energy by 20% to 30% per appliance. Some products are up to 90% more efficient. 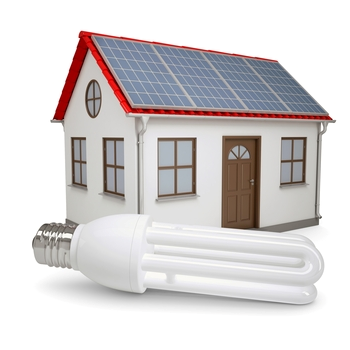 This will help you keep your home energy bills lower, despite days of heavy electricity usage. When you are not using a piece of equipment, make sure to turn it off. Unplugging it is also advised, as electronics continually draw electricity even when they are off. Modern computers do not last longer if they remain on constantly, unlike computers from decades past. If using an electronic device like a computer for a long period of time, set it to a low power mode. This will not only use less electricity, but it will also prolong the life of the device. Constant use builds up heat that can eventually damage your equipment. This heat also contributes to warming your home which causes your AC to run longer. Be sure to keep the lights off in rooms that you aren’t using to also cut back on unwanted electricity use and heat build-up. Using task lighting like desk lamps will further cut back on electricity use as well. Use rechargeable batteries for electronics like wireless keyboards and mice or powered headphones. You will save a lot of waste by using rechargeable over disposable alkaline batteries. If you are able, use a laptop over a desktop computer as laptops consume less power. You can also unplug a laptop when it is fully charged and use it without drawing power from an electrical socket. Screensavers only prevent burn-in on your monitor screen; they do not reduce electricity usage. Instead of setting a screensaver, set your computer to shut off the monitor after a period of inactivity, and/or have it transition to a low-power sleep mode. Another way to keep your energy bills low is to switch to a new electricity provider that offers cheap electricity rates in Houston. Shop Houston Electricity gives you the power to choose a new energy provider by helping you sort through all the providers and plans available to you. You can search by cheapest rates, renewable energy programs, and other criteria. The summer months bring increased rates, so switch now to save big in the coming months!